A trip to the Outer Banks’ beautiful beaches is certainly a enjoyable and memorable experience for many visitors and families. To keep it that way, beach safety must be a top priority. Whether you’re going swimming and want to find Outer Banks lifeguards, sailing or surfing and would love to rock out the best spot, are participating in any of the many Outer Banks activities at our coastal attractions, or if you’re simply taking strolls in the sand and then laying out to catch some sun, we want your time at the beach to be as safe as it is fun. Here are some tips and resources to help you stay safe. From Memorial Day to Labor Day, highly trained ocean rescue lifeguards are stationed seven days a week at designated beach accesses from Corolla to Nags Head. South of Oregon Inlet, ocean rescue coverage varies, however limited lifeguard stands and roving patrols are on duty at various locations. While each ocean rescue division vary slightly as far as hours lifeguards are on duty, all of them offer services from morning until evening. Lifeguard regularly update their information boards each morning with essential information related to ocean conditions, safety precautions, as well as water and air temperatures and tides. Lifeguards are a great resource and happy to answer any questions or concerns you have regarding the ocean environment, the beach or our community. And remember, always swim near a lifeguard! To find which beach accesses have lifeguard stands, see our town maps. Bright, sunny days seem like the perfect recipe for a great Outer Banks vacation. But enjoying the sunshine means also being aware of the dangers of prolonged exposure to the sun. During the summer months, the sun’s rays are especially intense. The reflection of the sun off of the ocean and sand can increase your chance for sunburn. Make sure you reapply sunscreen often – especially after swimming. Here are additional tips from the American Cancer Society to help protect yourself. Rip currents are channeled currents of water that flow away from shore, and can quickly pull even the strongest swimmers out to sea. 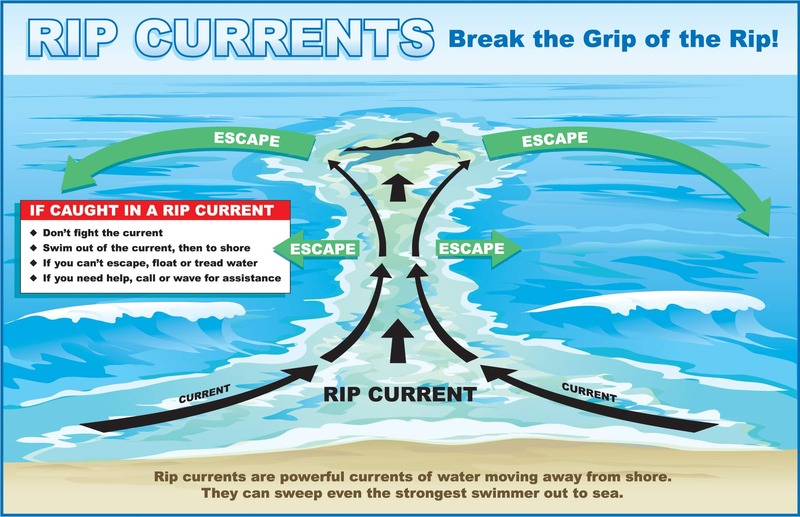 Since the current flows under water, it’s important to know the signs of a rip current and avoid the water in that area. Check the National Weather Service Surf Zone Forecasts for the latest rip current, high and low tide and surf height information. You’ll want to check the Outer Banks regional forecast. Flags on public beaches also indicate rip current alerts: green for low hazard and calm conditions, yellow for medium hazard with moderate surf conditions, and red for high hazard with rough conditions indicating rip currents. Be sure to look for flags on lifeguard stations and read the sign keys when arriving at the beach. If you see warning signs of rip currents or moderate or high hazard flags, stay out of the water and alert others to do the same. Jellyfish have clear, jellylike bodies, with tentacles with stinging structures hanging below, and swim under water. The Portuguese man o’ war has a colorful air-filled bladder that keeps it afloat on the surface of the water, with tentacles stretching underneath. If you spot either, stay calm, get out of the water and alert others. Most shark encounters with humans are cases of mistaken identity. Swimmers, surfers and others in the water may splash and present visual targets that mislead the shark, causing it to mistake people for prey. Most attacks occur in near-shore waters, between sandbars, or near steep drop-offs where sharks feed. Do not enter the water if bleeding. A shark’s sense of smell is acute. Watch for flags posted at many beach access sites signifying extreme weather and water conditions. Be attentive to any weather-related watches or warnings issued by the National Weather Service or local authorities, and follow carefully any precautionary directions or evacuation notices from public safety officials. When thunderstorms or lightning threaten, seek cover promptly in a large enclosed building, or if not possible, an enclosed metal vehicle. The National Weather Service recommends waiting 30 minutes until after the last thunder crack before returning to the beach. You can always get the latest on tropical storm forecasts from the National Hurricane Center.